Do you ever get that feeling that you are "the last to know"? I've been blogging since April, and it was only last week that I learned about "blog carnivals". I don't know how I missed it. I mean it's not like they are hiding or anything. So, for the last five weeks I've been posting these weekly roundups of Divided Government posts - which are functionally identical to a "Carnival of Divided Government" - except that I do all of the work finding them, don't tell anyone about it, don't invite anyone to submit their posts, and don't let anyones else participate in any way. Clearly there is an easier way, and that way is called "blog carnivals". A hat tip to Peter Porcupine and Don Surber for showing me to the carnival ticket booth. More on the carnivals later. First the weekly round-up (or "Un-Carnival", if you will) of Divided Government sightings (and potentially the last, as I intend to subsume this feature into a soon-to-be-announced Carnival of Divided Government, if there is enough interest). UPDATE: The First "Carnival of Divided Government" will be posted at DWSUWF on Monday, September 18. 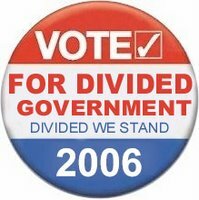 Send your "divided government" submissions, either via e-mail (see my profile) or via the Carnival of Divided Government submission form. The words "divided government" or "gridlock" or "single party control" must appear in the post to be considered. "My former student Stephen Slivinski, now director of budget studies at Cato, has just published his first book, Buck Wild: How Republicans Broke the Bank and Became the Party of Big Government. There's lots of neat stuff in this book, but the best is his chapter on the libertarian benefits of divided government..."
What can I say. Slivinski devoted a chapter to divided government. If anyone writes a complete book about it, I guess I'll just have to turn over the entire blog to him/her. "The law was the product of divided government. Republicans initially offered legislation that was far too draconian. A Democratic President forced compromise. It was a textbook example of how government should work. It was a model of the vital center in action. Indeed, one of the primary reasons why Democrats may fare so well in November is the yearning for a return of the checks and balances of divided government." Mr Finch of In the Library With Mr. Finch had a couple of expansive posts on topic with "Divided We Stand: Part IV" and "Follow on points". "A model has been developed which states that the kind of government America has works best, when the elected bodies of that government are divided between the two major parties... Single-party government is highly correlated with corruption and perceived incompetence. (Small wonder, with no opposition actually IN government to blow the whistle.) ... Might there be a third way? A President whose party controls one, but not two, of the houses? I don't guess a single-party government - under either party - is going to get it. Still less, a grid-lock scenario. How about the alternative?" I still call Mr. Finch's "third way" a divided government. 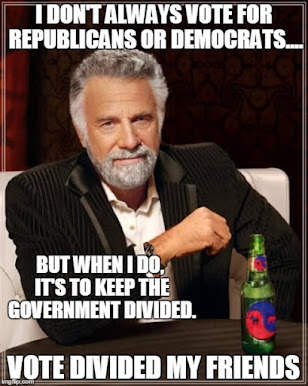 In fact, a divided congress is the preferred scenario for divided government. "The fact is that President Bush is not a conservative. He is conservative on some issues, maybe more than half of them, but he is not a "movement conservative". Advancing the cause of conservatism is not one of his goals. He honestly believes that big activist government is good for the nation. This makes it very unlikely that he will find himself at odds with a Democrat House in the same way that President Clinton was with a Republican one. Bush's sincere belief in big government coupled with his extreme reluctance to use the veto will likely mean an explosion of spending unlike anything seen in US history. Unless the Senate, which will certainly stay in Republican hands puts on the brakes... It’s clear from the fact that this discussion is even occurring that the Republican majority has a dismal record on limiting spending. The party has lost its fiscal compass. If the Republicans do lose the House this cycle, it will be hard to argue, based on spending policy, that they deserved otherwise. The ideal scenario for fiscal conservatives would probably be a brief period in the wilderness, a single cycle in which the GOP could regroup and refocus on the core fiscal issues that powered the Reagan revolution, led by a presidential candidate with a genuine commitment to spending restraint. But there are no guarantees in politics, and the Democrats could instead hold onto control, starting an era of even bigger government." It is this simple Lemuel: If you re-elect this crop of big spending, big deficit, big government Republicans under the mantle of this big spending, big deficit, big government president, then you will get even more big spending, big deficits, and big government. The dynamic of partisan Republican/Democrat tension in a divided government will reign the spending in, just like it always has. It is the party division, not ideological division that is causal. The fact that GWB has no fiscal ideology is irrelevant. He is still a Republican. New, but related topic: The newly discovered Carnivals. Once I found the ticket booth, I started submitting posts (after all, I had 5 months worth to choose from), and what do you know, we hit the trifecta today. First up, Don Surber is hosting the "Rino Sightings:Ninja Warrior Edition" carnival and linked to our post called (coincidently) "Big Spending, Big Deficit, Big Government Republicans". Also linked is a great post by Politburo Diktat on "what we should do next in Iraq". He has some good advice for our president. Next up, Ken Goldstein at Random Thoughts Notes and Incidents is hosting the "Carnival of the Decline of Democracy" and tapped our post "Why You Should Vote Like Me -or- I can't get no satisfaction". I cannot say that I agreed with much else in that carnival, but I did find the Muslim-American perspective of Abu Sahajj of the Wa Salaam blog commenting on "Arab Criticism of Democracy" to be quite interesting. "I have a lot of sympathy for this position. One of the reasons that the Republicans are in trouble is that they've been spending like a bunch of Democrats. If we were not at War, I wouldn't mind a Democratic House with a Republican Senate (gotta have majorities here in order to get even compentent judges confirmed). As it is, a Democratic House means surrender in Iraq, impeachment hearings, and encouragement to the enemies of freedom everywhere." But wait! Late breaking news. Matt Barr at the "Socratic Rhythm Method" is hosting the "Carnival of Liberty: Life Liberty & Property are in Jeopardy!" That's "Jeopardy!" as in Alex Trebeck. 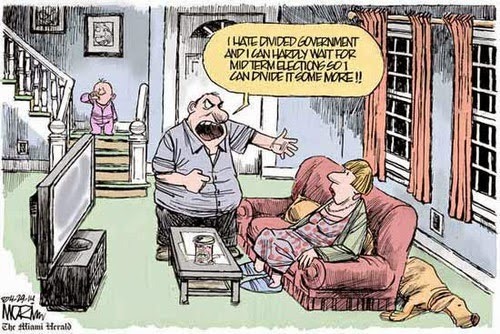 DWSUWF is proud to learn that our post "An Illustrated Guide to Divided & Balanced Government." was selected for the prestigous "That Gov't Governs Best" category for $500. I also recommend that you say "I'll take 'War me Down' for $400 Alex." for an introduction by Stephen Littau of "Fearless Philosophy for Free Minds" to Irshad Manji a brave and outspoken voice for Islamic reform.